Jennie has been here for just over 4 weeks and owner Carole came to see her yesterday, so it was time for some photos. 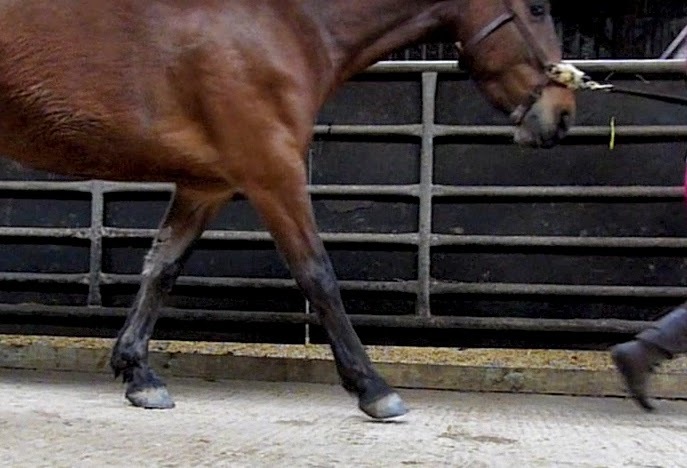 As you can see from these, her front feet are slowly improving but unfortunately Jennie is still very uncomfortable and also has a hind limb lameness to contend with which is making it difficult for her to move around as much as she or we would like. 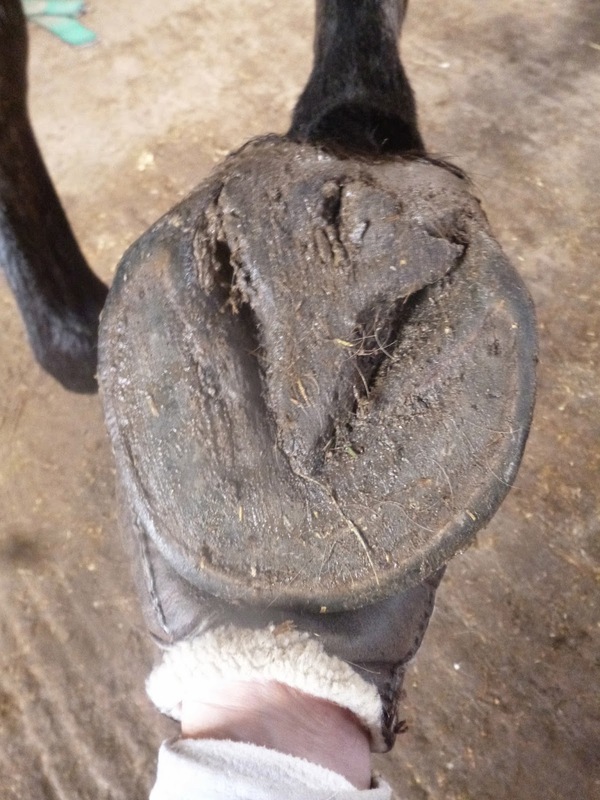 Her front feet were very contracted particularly through the quarters and heels when she arrived and this will take time to improve but at least the tracks are providing stimulus which is helping her palmar hoof. 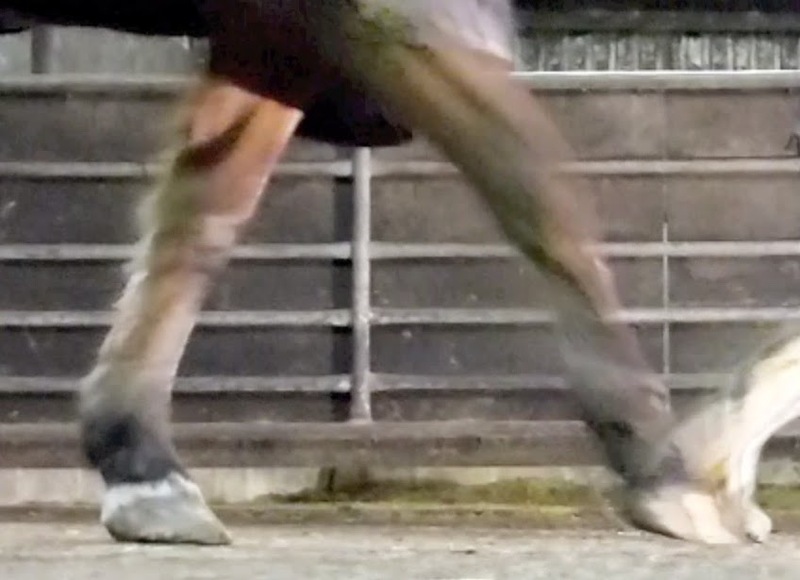 Lateral shots show a good improvement in this foot despite her movement being relatively limited. 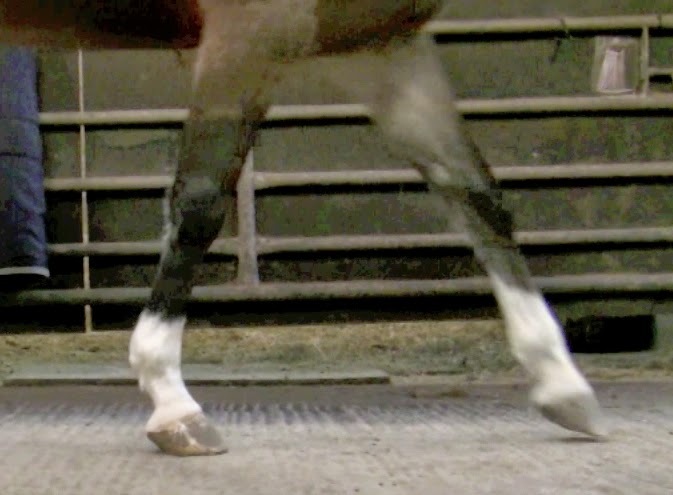 On her LF (which is her lamer foot and which is also affected by her lame RH) she has a similar but less marked change; this is most noticeable when you compare the angle of the heels. 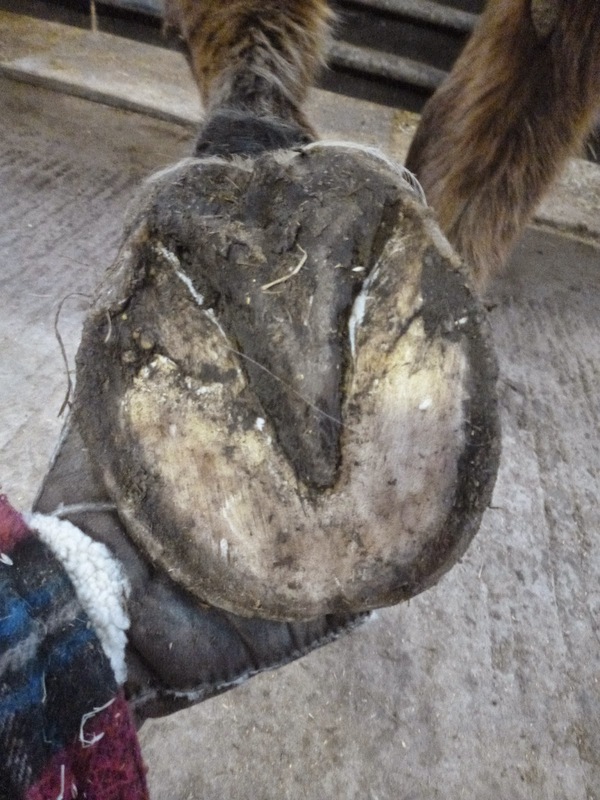 This foot is also de-contracting but has doing so more slowly, for which the RH lameness must be a contributory factor. When a horse has not 2 but 3 bad legs it makes things very difficult not only for the horse but also for the owner and of course for me. Lots of good vibes for Jennie please - we certainly need them! 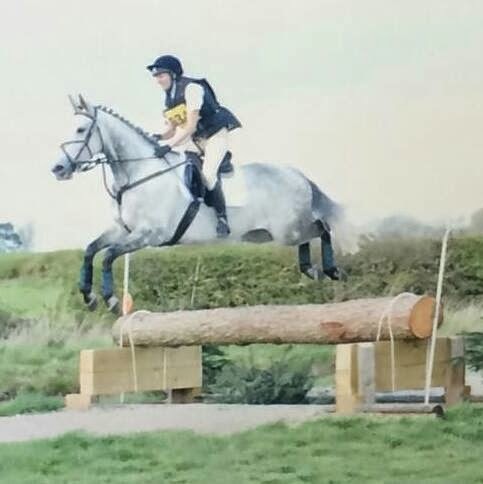 Brilliant results from 2 of the ex-rehabs over the weekend - both Chester (the original Chester, not Cheshire Chester who is still here at the moment) and Isla were out competing. "He was a star - amazing, a complete pro - and won both Prelims with 73.9% and 71.4% - he was 5% in the lead in the Prelim1!" So well deserved red frillies for Chester and Louise and lovely comments from the judges about their "super partnership". "2 issues cross country, first that we were over 70 seconds too fast, the other that she wanted to jump the bigger option each time, she either remembers the course from 3 years ago or recognizes pink numbers?!?" Again, Becca and Isla have only got to this stage after miles and miles and weeks and weeks of work and their success is a huge testament to the hard work they have both put in - fantastic to see! Gemini goes home at the end of this week and it was good to take the opportunity to review her feet with owner Diane yesterday. 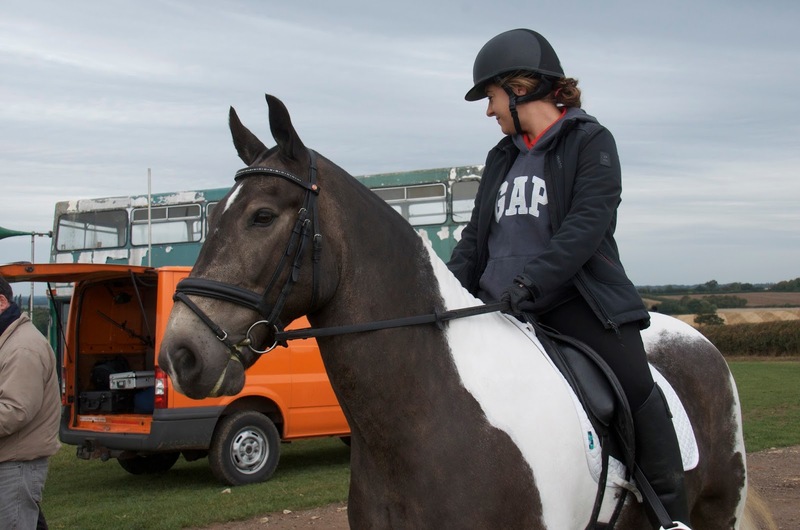 Gem is unusual among rehab horses as she has never been shod but nonetheless developed a medio-lateral imbalance which led to navicular and collateral ligament damage. Comparison shots of her caudal foot show a huge and rapid improvement in her digital cushion and frog as well as a much more symmetrical and balanced foot. 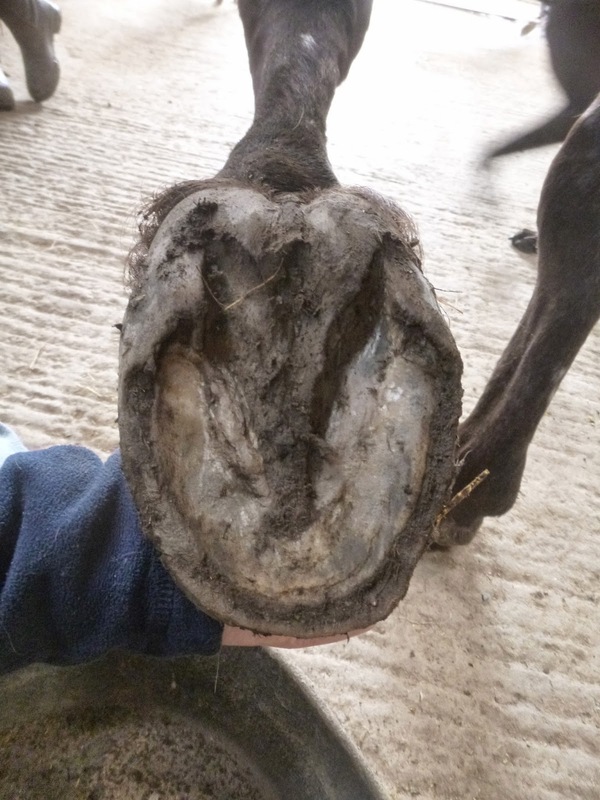 Gem had an advantage over most rehab horses as she had never had the caudal foot compromised by shoes so she has strengthened much more rapidly - if you ever want a reason for not shoeing young horses, these sort of changes should give you a clue! 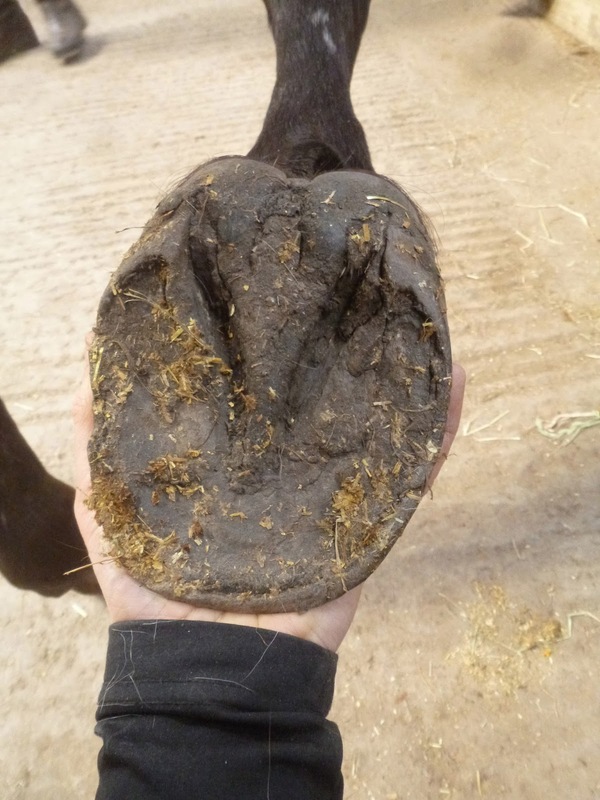 Lateral shots show a shorter toe and less under-run foot with a new angle of better growth evident in the top half of her hoof capsule. 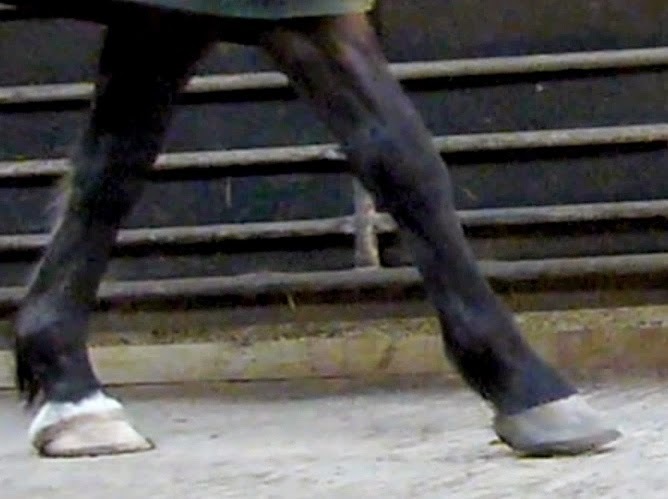 Shots from the front show that Gem is now making use of her medial deviation to support the hoof and limb, which is less distorted than it was on day 1. 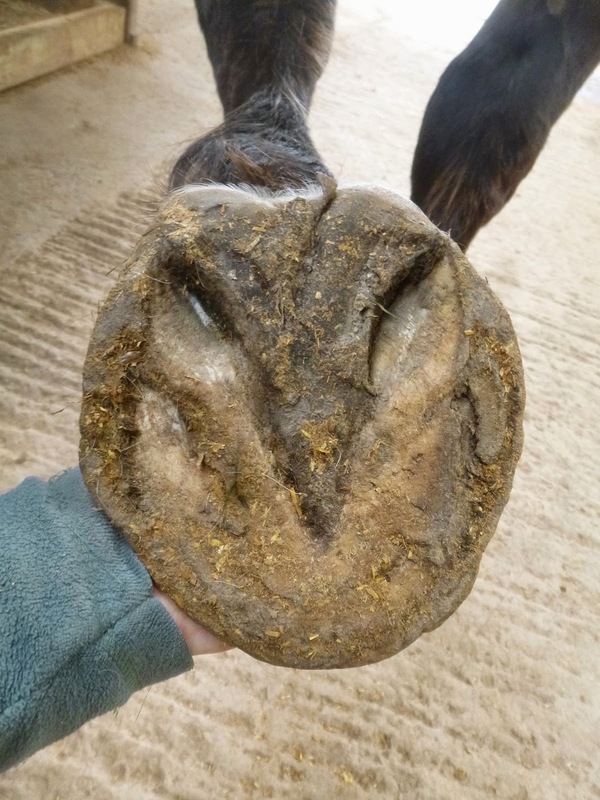 This will probably become less dramatic over the next few months but it will be important to allow her to grow and wear this as she determines, rather than having hoof balance imposed by someone else. 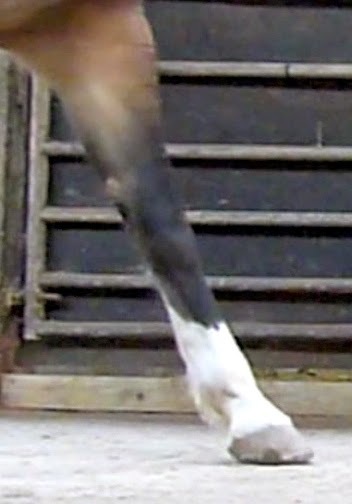 Sole shots of her other foot give a clear indication of how the concavity and sole strength of her hooves has developed. Her frogs will get better still over the next few months and as the new hoof capsule grows down. 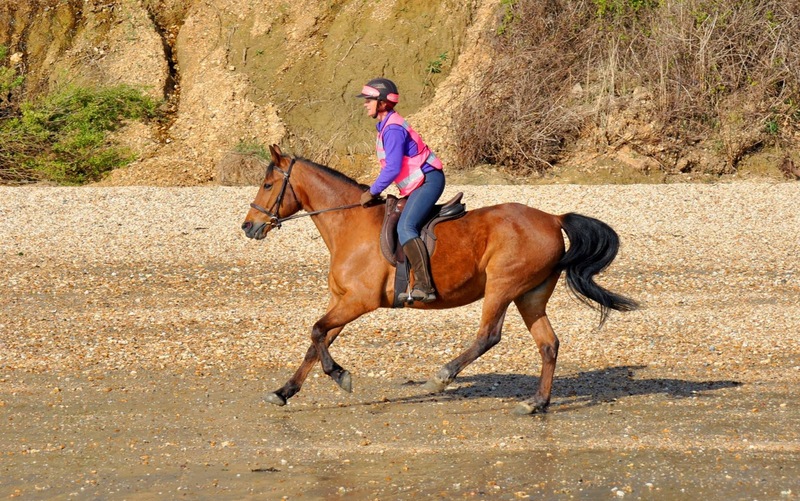 And finally the proof of the pudding - stills and her video footage showing a much better landing and longer stride, which Diane can also feel under saddle. Gemini from Nic Barker on Vimeo. Roger has been here since the middle of January and is going home tomorrow, so just time to fit in his last update, starting with stills from his video clips. 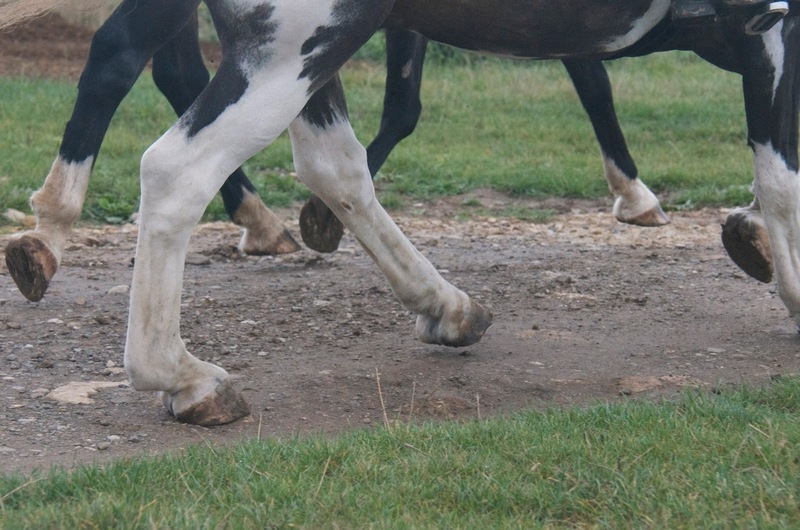 He arrived with lots going on, including a DDFT tear and check ligament damage - the details are here - he was pointing his LF and landing toe first because in addition to the tendon damage he also had (as we found out a few days later) an abscess in that foot. Roger, like most horses, is going home with improved hooves but with lots of development still to come over the next 3-4 months. 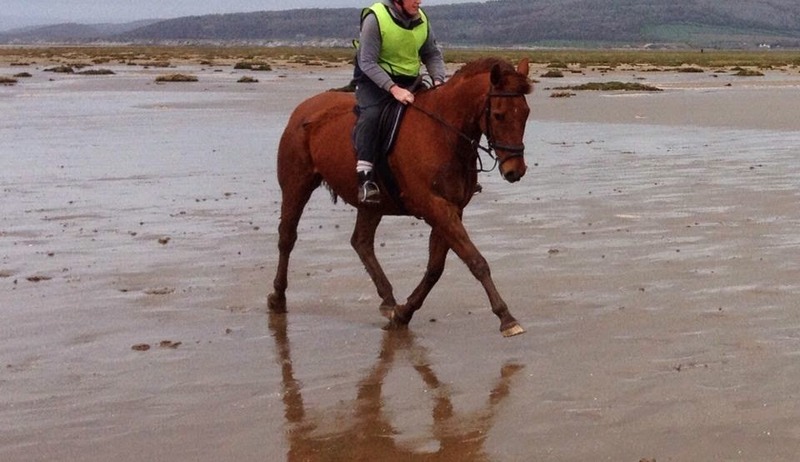 I'm pleased to say that he is now engaging the back of his foot, which will take stress off his DDFT, and as he continues to work at home he should become more and more capable. 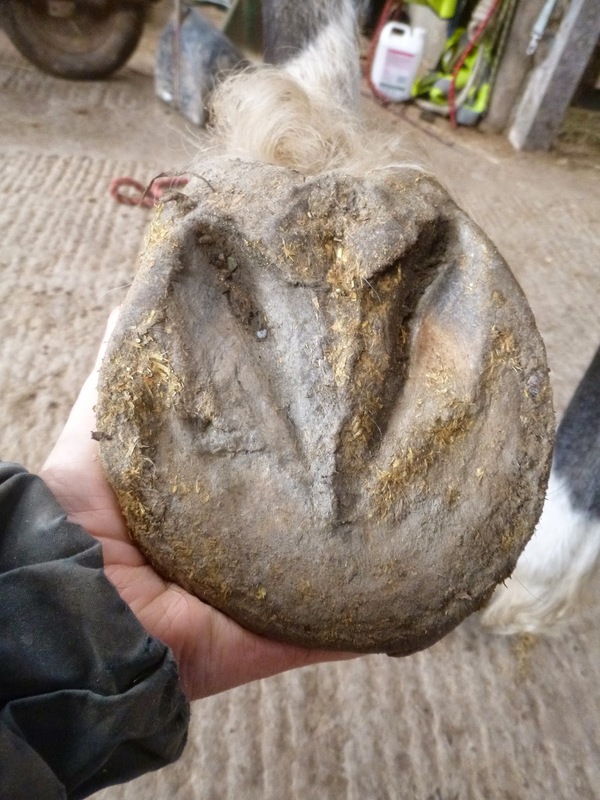 His LF on arrival was clearly very under-run and although his palmar hoof is stronger today you can see from the up-to-date photo below that there is still lots to do. His frogs weren't too bad when he arrived but that had not stopped him from landing toe-first, unfortunately. This is the foot which had an abscess though its not visible in the initial photo above. Today's photo shows a better frog and he is also developing better concavity but you can also see the area of damage on the medial side of the photo where the abscess has done damage. The exit was at the coronet but as his foot is growing down the internal damage is appearing at the sole. 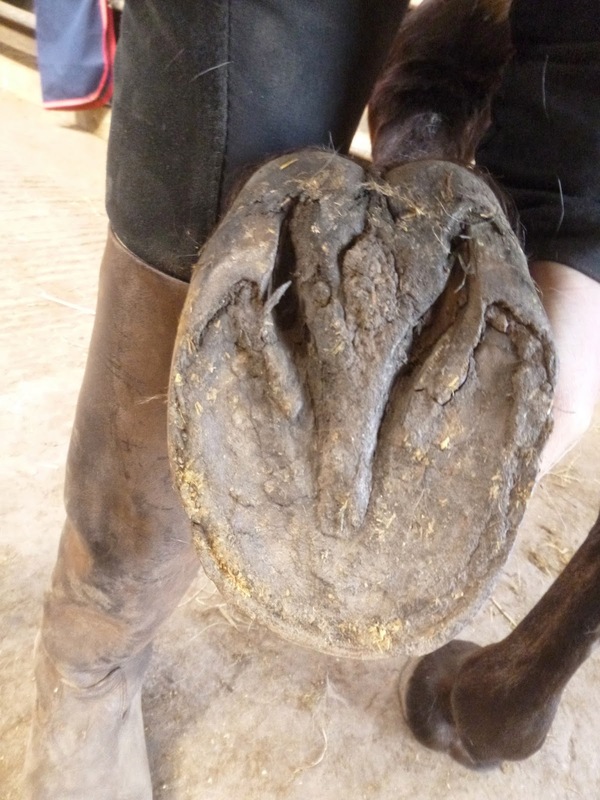 Its old now and not causing him a problem except that there is of course an area of weakness which needs to grow out before his foot will be fully balanced. The all important caudal shots show an improving digital cushion but still of course lots of work for Roger and Su to do over the next few weeks and months. Roger from Nic Barker on Vimeo. I seem to be running to catch up this week - late blogs and too much to put on them, masses of video clips that I haven't had time to upload yet and photos in desperate need of sorting out and no time for that either. I promised an update on Holly and here it is. She has been here nearly 8 weeks and like many horses has hind limb issues as well as front limbs issues. 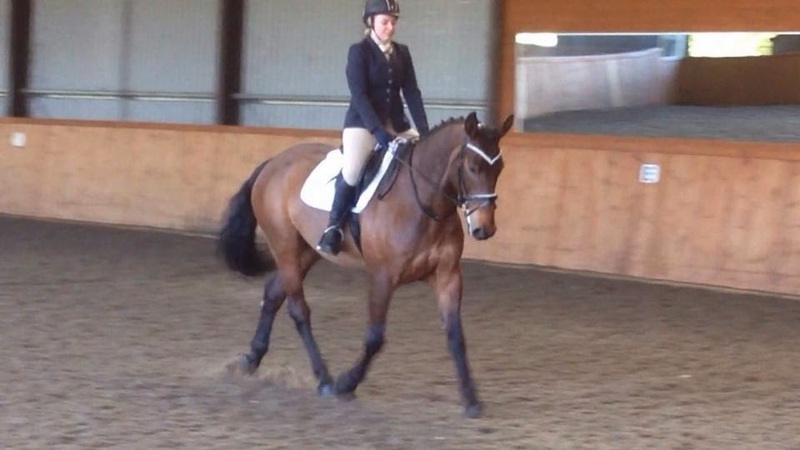 Her 3 week update photos are here and show how she had begun to improve her poor medio-lateral balance. You can see from the top photo of her LF how she also had a broken back hoof pastern axis. 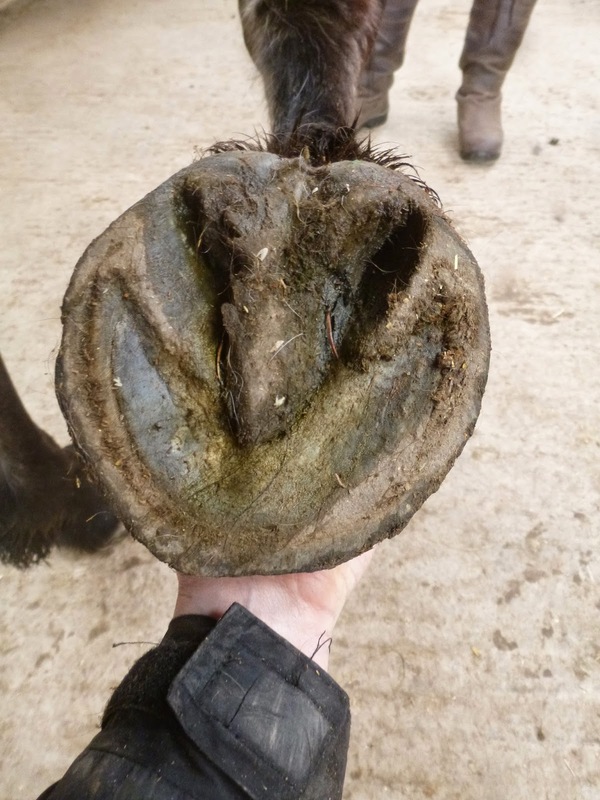 In my experience this is always linked to a weak palmar hoof and typically as the palmar hoof (particularly the frog and digital cushion) strengthens and develops the hoof pastern axis improves as well, as is shown by the 3 week photo above. 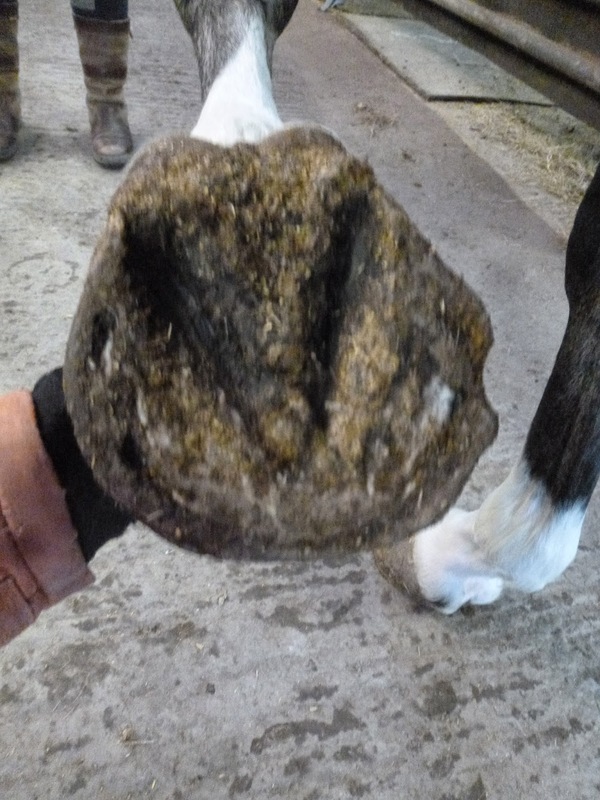 Today, at nearly 8 weeks, the palmar hoof is better supported still. 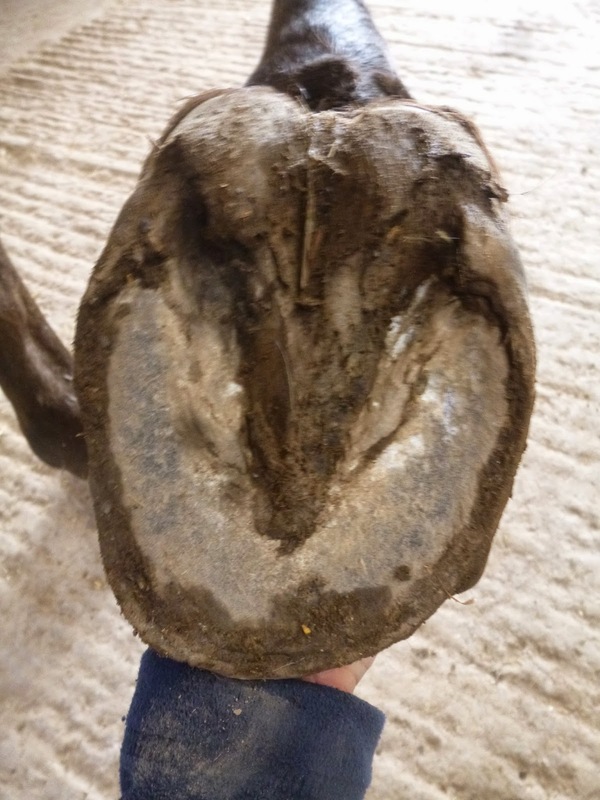 The hoof pastern axis is much better and notice that the hairline is also less distorted than in the initial photo. I hope you had a great Easter weekend - the weather down here was absolute perfection which isn't something you can normally say of bank holidays in the UK. I have masses to post on the blog this week, including updates on Holly, Gem and Jennie and some lovely photos and video clips which have come in of former rehabs but before all that I thought you might enjoy this. 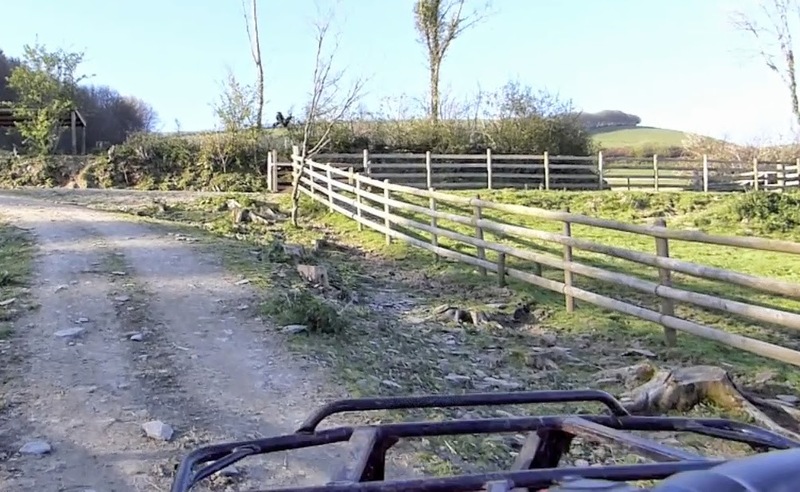 While SB was down over Easter I took advantage of his excellent quad-driving skills to do some filming. We toured the tracks on the quad and took the camcorder with us. Track from Nic Barker on Vimeo. It takes quite a long time to drive round the whole thing so I have edited the footage so that it runs at double the actual speed - hope you find it entertaining. For info, this was taken in the evening, hence all the horses are on the grass. Couldn't resist posting these superb photos of Pete, who went home in February. I've been kindly given permission to post them here by Diane Ashford at Paws and Pose Photography (her Facebook page is here) and I thought they made a perfect post for the Easter weekend. Happy Easter everyone, enjoy the sunshine and I hope you all have as much fun as these two over the next few days! 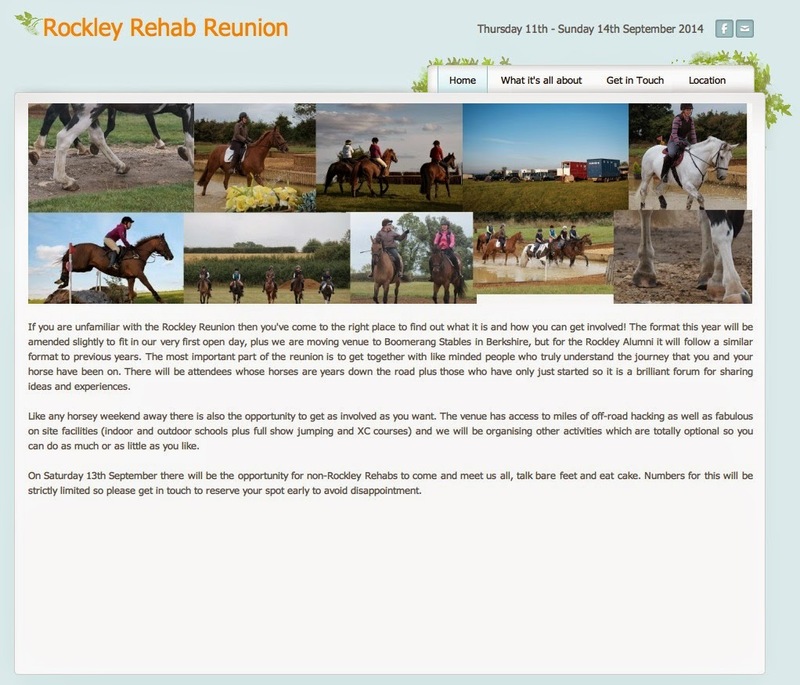 The site is here: http://rockleyrehabreunion.weebly.com/ and its looking great - huge thanks to Krista for pulling it out of the bag once again! We had such a blast last year - those of us who were there are already looking forward to getting together again and there will also be plenty of new faces as well. 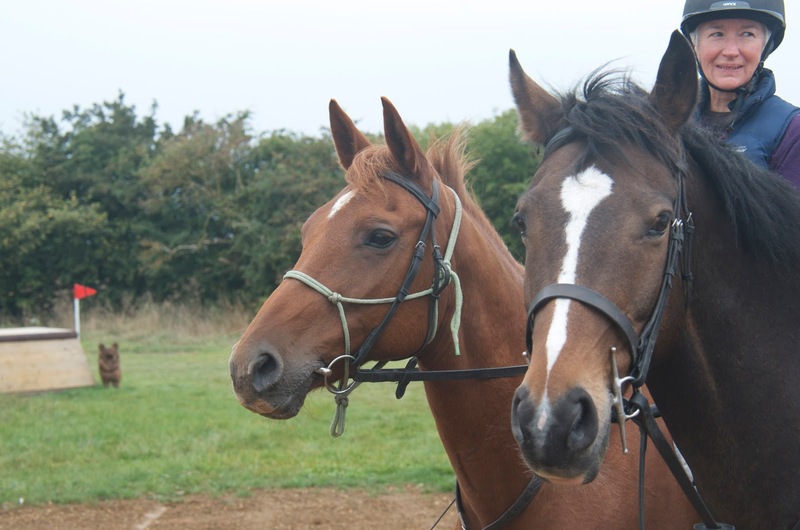 We're also having an "open day" on Saturday afternoon for anyone who is interested in coming along, meeting us and the horses and finding out more about barefoot and rehab - no doubt there will be plenty of tea and cake consumed then as well - so if you'd like to come to that or to the whole event just get on the website. 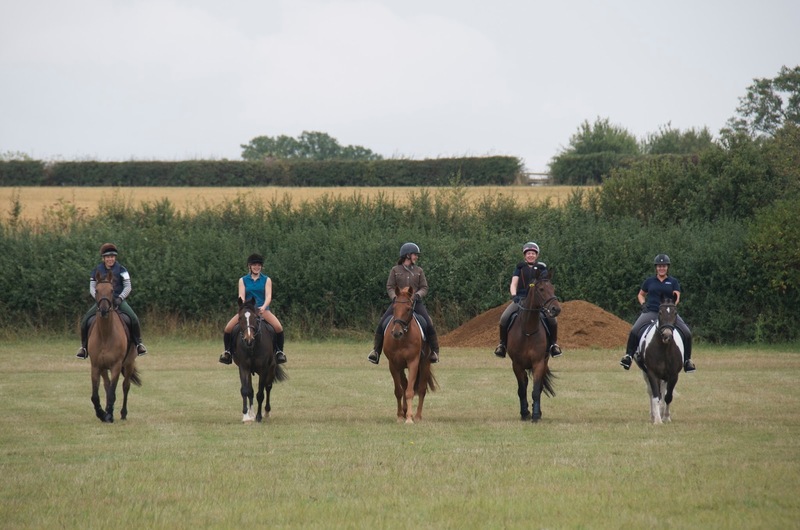 We have space for only 30 horses (if you bring your horse you also automatically get your camping place) and numbers for the open day are also limited. There are loos and showers on site and there may be the option of staying in caravans if there is enough interest - the RRR Facebook page is a good place to go for updates on this and practicalities like transport. The cost is discounted til the end of July (the open day is free, we just need your name and contact details) so its worth booking before then if you can. ...the ex-rehabs can do it all! 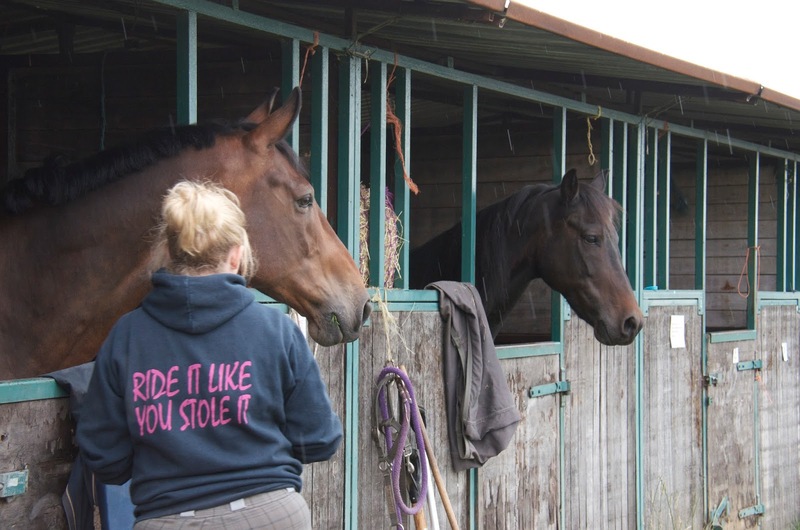 More fab updates came in over the weekend along with some cracking photos and proof if proof were needed of the multi-disciplinary talent which can be found amongst the former rehab horses! 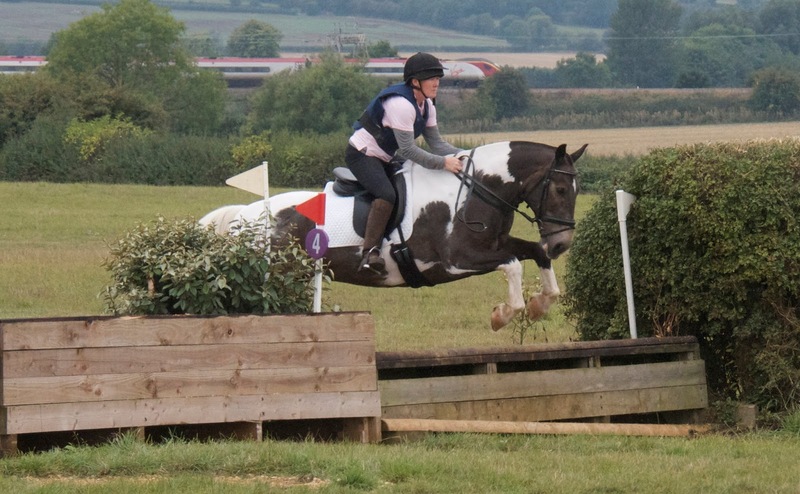 Here is Lucy (who was here in 2011) competing BE with Amanda and absolutely flying. 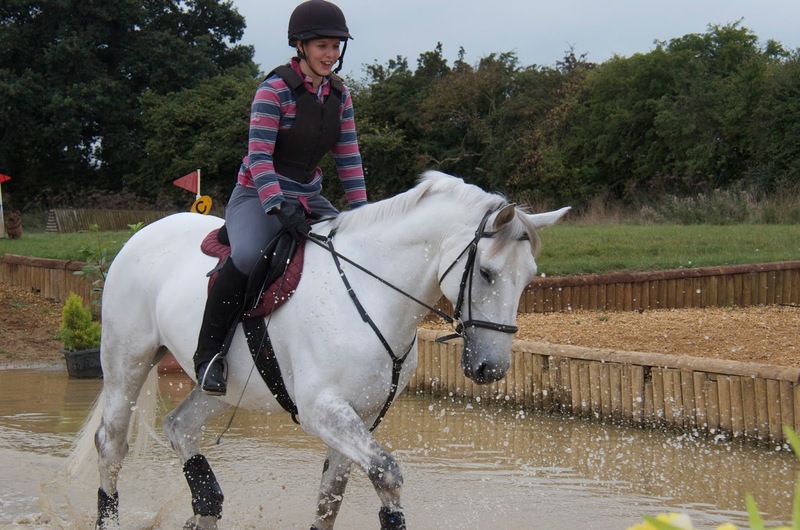 I always had a feeling that she would be an incredible event horse and its great to see that promise being fulfilled! 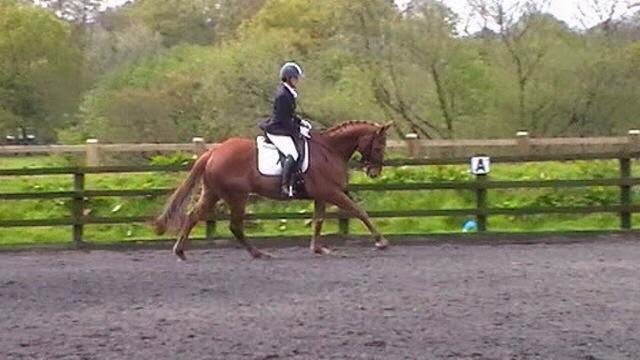 Krista and Buddy are also doing brilliantly and looking amazingly elegant. I think this could be a very exciting year for these two! Last of the photos, and here is dear Ginger (whom I blogged about last week as well), aged 21 and obviously feeling extremely well, bless him. 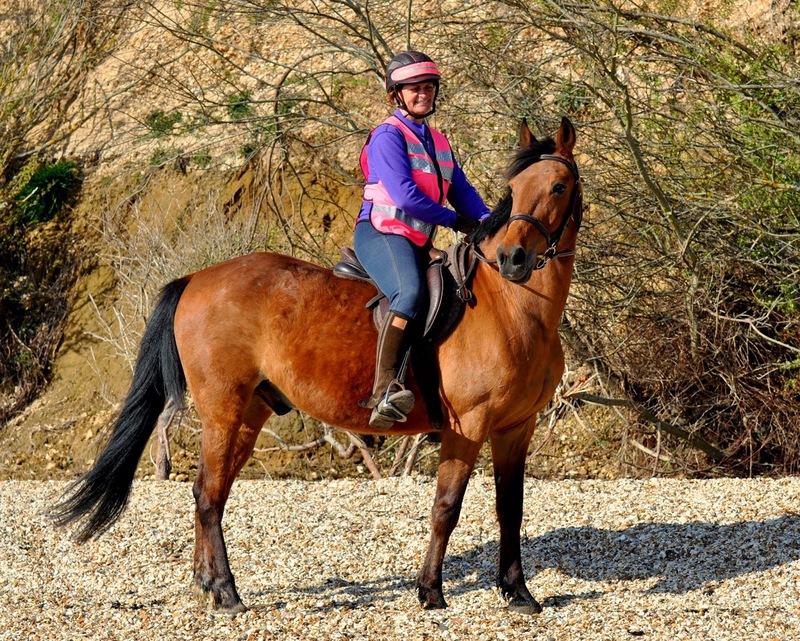 Last week saw a red letter day for Brigitte, who has been here longer than most rehab horses but who had found it incredibly difficult to improve how she was landing in front. 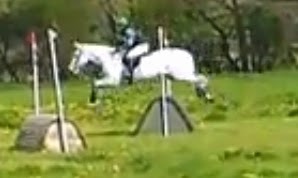 However after all sorts of ups and downs she finally has a consistent heel first landing on all four feet - thank goodness! 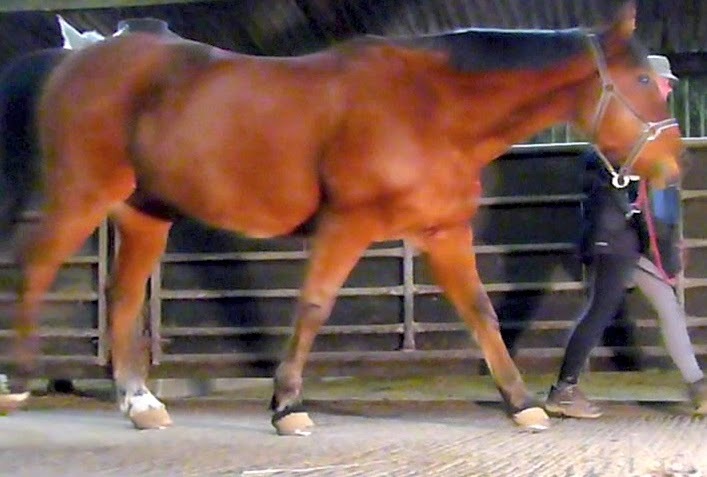 Its taken much longer for her than for most horses so its fantastic to see her at last engaging the back of her feet. And here is how they look now (below) compared to when she first arrived. Quite a change, I hope you will agree, and no trimming required. Can you recognise this horse? Why not just settle for the quick fix?